COLUMBIA, S.C. – South Carolina Agriculture Commissioner Hugh Weathers kicked off the strawberry season at James R. Sease Farms in Gilbert, SC with the first “official” pick this morning. Spring has sprung in South Carolina and it’s primetime for everyone’s favorite treat: farm fresh strawberries. South Carolina is home to over 40 strawberry farms offering both “U-pick” experiences, as well as pre-picked berries. Spartanburg County leads the state in strawberry acreage, followed by Lexington County. Strawberry farms are open April through May, but visitors should check the farm’s Facebook page or website for specific opening dates, hours of operation and directions. For a full listing of strawberry farms, visit scfarmfun.org. 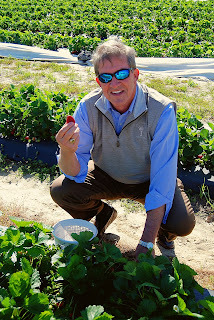 SC Agriculture Commissioner Hugh Weathers picks the first strawberries of the season at James R. Sease Farms in Gilbert. Editor's Note: This is the same place I pick strawberries each year. Great location.